Add lively, realistic acoustic drums to your music with Reason’s most popular drum library. 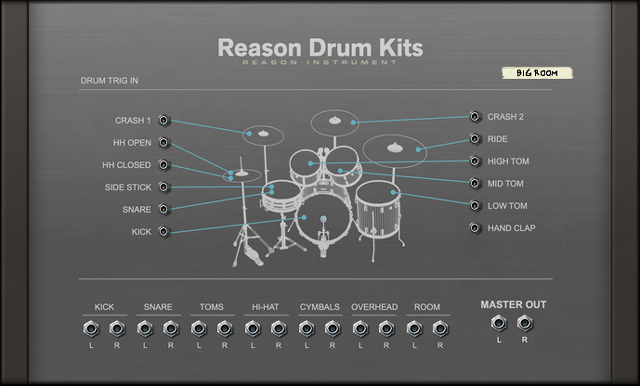 Welcome back Reason Drum Kits! Add lively, realistic acoustic drums to your music with Reason’s most popular drum library, now re-imagined as a Rack Extension instrument. With a gorgeous new interface, the entire Hypersampled drum recording session is laid out before you, making it easier than ever to create the drum track your song needs. But where Reason Drum kits really shines is in the way so many creative decisions are open for you. All drum kits were recorded using the full mics array in the recording room, and all those recordings are available in Reason Drum Kits when you create your drum sound. Do you want a tight and intimate sound? Go for the close mics. Want a big and loud drum kit? Go wild with the overhead and ambience mics! Reason drum kits comes with sets of expertly crafted drum kits for you, but you can of course swap out individual drums if you want. Or build your own kit from scratch. 75 different drums, cymbals and hi-hats were recorded and you can combine them any way you like. From thousands of samples, each drum kit has been meticulously crafted to allow for expressive performances. There are multiple samples per instrument to allow natural rolls and fills without the robotic machine gun effect of just re-triggering a single sample. Rim shots, ruffs, side stick and other ways that drummers turns patterns into performances are all there for your creative use. Included with Reason Drum Kits is also a large library of 600+ MIDI drum performances in a wide range of styles. These custom made MIDI clips can be used as a perfect starting point for building out a solid drum track for your song. 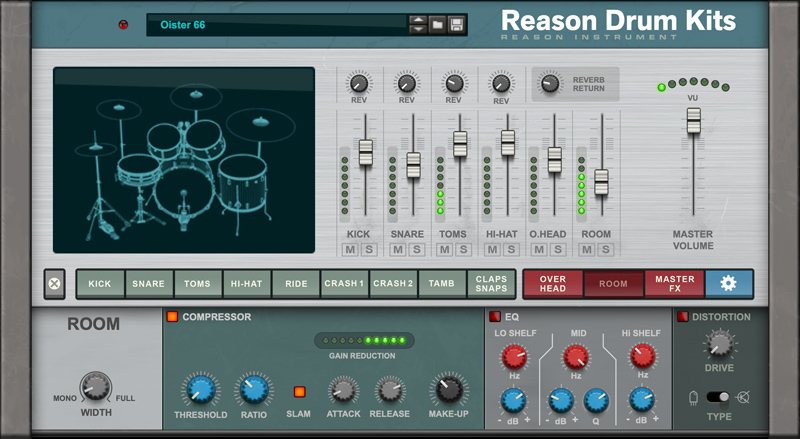 To add extra polish, Reason Drum Kits features its own reverb and bus compression. If you want even more detailed control of your mix, each drum channel has its own output so you can finish your mix in Reason’s legendary analog modeled mixing console. Reason Drum Kits is more than a fantastic collection of natural sounding drum kits. It’s a complete live drum recording session packaged up in an easy-to-use Rack Extension. Highlights the selected instrument and can also be used to trigger instrument. Great for auditioning sounds when in tweaking mode. Reason Drum Kits comes with 50+ complete drum kits, covering a wide range of styles. Adjust individual channel levels to your liking, and add reverb if needed. Can drastically alter the sonic quality of your drum performance. From nothing, which is good for string quartets and a nap in the studio, to full-on sonic mayhem (also known as loud) which is great for rock n’roll music. The high-tech VU-meter gives you visual indication if your drum kit is making little or a lot of noise. Each instrument has its own set of controls and you select the instruments you want to tweak here. Here you activate controls for the overhead and room mics, as well as settings for the compressor and reverb in Reason Drum Kits. Most people are happy to mix the entire drum kit in Reason Drum Kits. But maybe there’s some specific routing you had in mind. Maybe that specific phaser on the overheads, you hippie! Or maybe you want to mix all the channels separately in Reason’s wonderful main mixer. It’s up to you! Different instruments have different settings, to give you as much control over the sound as possible. Reason Drum Kits can use several different keymaps. Use the default for maximum playability and expressiveness. Use General MIDI if you plan to use GM files, etc.